Library image #617: Canyon rocks above Boulder Creek. The United States Congress designated the Boulder Creek Wilderness (map) in 1984 and it now has a total of 19,918 acres. All of this wilderness is located in Oregon and is managed by the Forest Service. Small waterfalls and rapids connect the series of quiet pools that make up Boulder Creek, a tributary of the North Umpqua River. Ponderosa pines flourish on Pine Bench, near the lower end of the Wilderness, and are thought to be the largest such stand this far northwest of the crest of the Cascade Mountains. 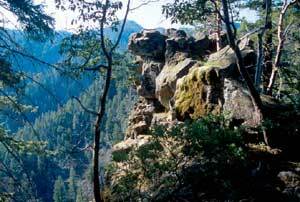 The rocky monoliths and outcroppings attract (and challenge) technical rock climbers, especially in the southern portion's Umpqua Rocks Special Interest Geologic Area. Elevations range from 1,600 feet to 5,600 feet. The Spring Fire in 1996 and the Rattle Fire in 2008 burned most of this wilderness area. Expect rapid brush growth and persistent blowdown on the 10 miles of maintained trails in the years to come. Planning to Visit the Boulder Creek Wilderness? How to follow the seven standard Leave No Trace principles differs in different parts of the country (desert vs. Rocky Mountains). Click on any of the principles listed below to learn more about how they apply in the Boulder Creek Wilderness.